AT&T Office@Hand Skype for Business app Overview allows you to make and receive calls, send and receive SMS texts, initiate Office@Hand online meetings and audio conferences. Follow the steps below to learn more about initiating a meeting on the Office@Hand for Skype for Business app. Note: You need to have the Office@Hand Meetings client to use this feature. Click the Initiate Office@Hand Meetings icon from the Skype for Business contact menu. Enable/disable a meeting password to join. Enter a password if enabled. Enable/disable participants to join the meeting before the host. Clicking Invite with Text and Start Meeting will send your selected contacts an invite and initiate the meeting. 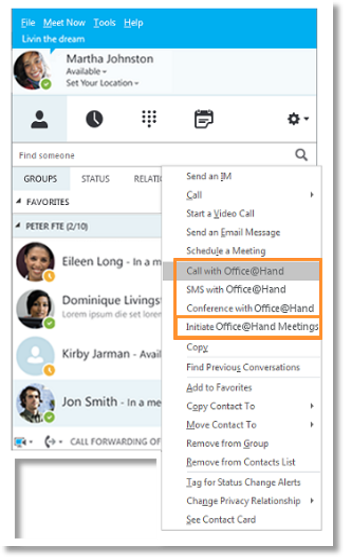 You may right-click on a Skype for Business contact and select Initiate Office@Hand Meetings, the contact’s name and phone numbers will be populated in the drop-down below the To field in the Office@Hand for Skype for Business app. Note: If you have no access to AT&T Office@Hand Meetings, the app will show an error message.